Diplomat Wilhelm Philipp Best was born in Hanover in 1712, but he spent most of his working life in London. After completing his studies at the University of Helmstadt, he entered the service of George II and was posted to the Hanoverian legation in London in 1746 where he remained until about 1782. From the 1750s to the 1770s he lived at no. 6 St James’s Place. His most significant contribution to Anglo-Hanoverian relations during his long residence in London was as the representative of the University of Göttingen, the Hanoverian ‘national’ university (founded in 1737). He was overseeing the London side of the acquisition of books for the university’s rapidly growing library. His surviving correspondence is a crucial source for the early history of the library. 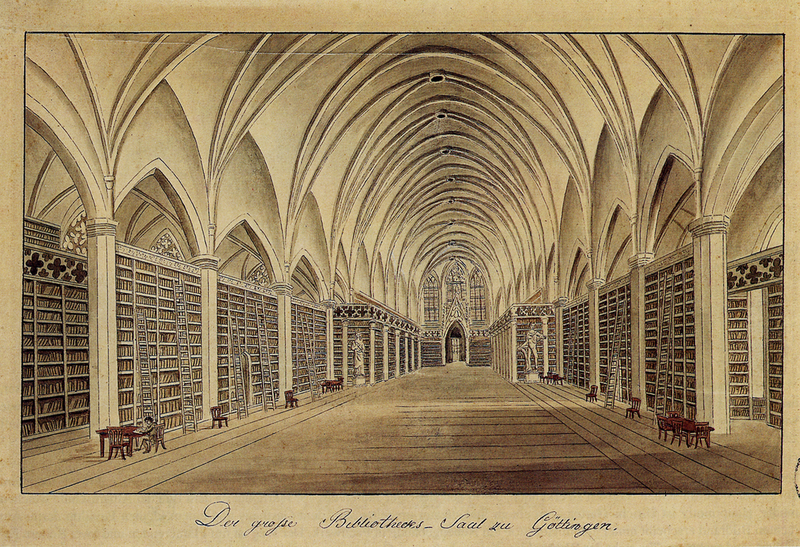 By 1800 it was to become the largest single assembly of books in Europe. Books acquired through the London book trade formed a significant proportion of the estimated 133,200 held by the library by this date. Their presence in Göttingen contributed in no small measure to the increasing awareness of English-language authors in Central and Eastern Europe. From about 1782, when Best appears to have retired to Hanover his role was taken over by his son Georg August Best. Wilhelm Best died in Hanover in 1785. Philologist Franciscus Junius [Francis Du Jon] (1591-1677) was appointed librarian to the Earl of Arundel in 1620, becoming mentor and instructor to De Vere, Earl of Oxford, who would serve in the Dutch army from 1642 to 1646. During his stay at Arundel House he began his studies in Anglo-Saxon literature. He returned to Holland in 1650 where he published his Paraphrase of Caedmon in 1655. He also published a study on early Teutonic languages together with a fellow scholar of Anglo-Saxon, Thomas Marshall, who had been exiled from Oxford in 1648 because of his Royalist sympathies. In 1674, Junius repaired to Oxford spending his last years with his nephew Isaac Vossius, Canon of Windsor. He left his collection of books and Anglo-Saxon manuscripts along with a set of documents he had transcribed from Old English to the Bodleian Library. Cambridge University Library has existed in some form since the beginning of the fifteenth century. The earliest catalogue is dated ca. 1424. After the magnificent library Thomas Bodley built for Oxford University during the early years of the seventeenth century, Cambridge was desperately keen to establish an institution that could rival the Bodleian. Ambitions were high, but funds hard to find. The only accessions of consequence were presentation copies from their authors (from Bacon in particular). In 1629, linguist Abraham Wheelocke was appointed as University Librarian. He was admired for his scholarship in Anglo-Saxon studies, and, in 1632, took on the position of the first Professor of Arabic at the University (and in England). His librarianship was crucial to Cambridge. When appointed the library held barely 1,000 volumes. After his death in 1653, it owned about 12,000 books. He was active in persuading donors to present their collections, and, more importantly, in ordering and describing which books entered the library. One of the many intellectuals who donated copies of their work to the University Library was Gerardus Joannes Vossius who, in 1629, had been offered a Professorship in History by Fulke Greville, Lord Brooke. Wheelocke assisted the university in obtaining the collection of some eighty-six oriental manuscripts assembled by Thomas Erpenius, Professor of Arabic at Leiden University. This collection had been purchased by George Villiers, Duke of Buckingham, in conditions of great secrecy from Thomas’s widow in 1625, with the avowed intention of presenting them to Cambridge University. Villiers was close to the Low Countries. In 1619, for example, he appointed Middelburg-born architect and art agent Balthazar Gerbier as keeper of his outstanding York House picture collection. The impressive Erpenius-legacy was finally presented to Cambridge by the widowed Duchess in June 1632. It contained a wide variety of Eastern manuscripts, mainly Arabic but also Turkish, Persian, Hebrew, Syriac, Coptic, and Javanese, and included five of the oldest Malay manuscripts in existence. Previous to that magnificent acquisition, Cambridge possessed only a single Arabic manuscript. Leiden put Cambridge on the map of Eastern learning.